Get inside for some free A/C! Plus have some free food and drinks at the Chase and Amex Lounges. Note: the Amex Club lounge is free for all Amex members (on the 2nd floor). 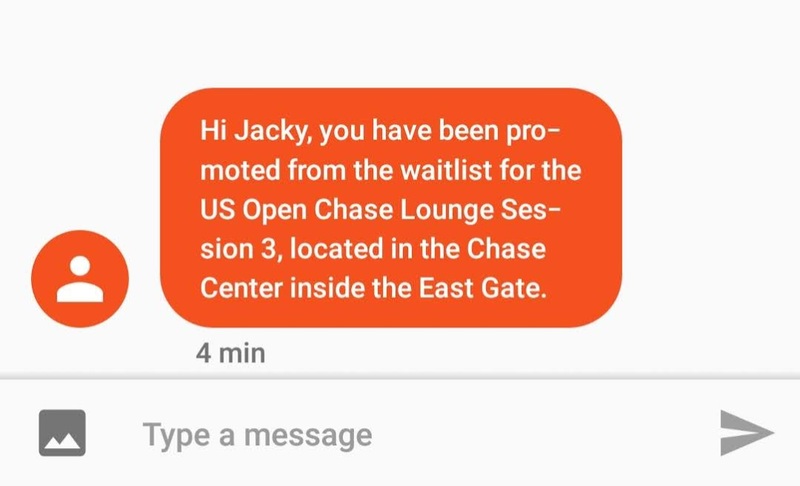 The Chase Lounge is an Amazing perk for Chase cardmembers. It is a very large space upstairs at the Chase building. The entrance is located immediately to the left after entering the East Gate Entrance. The check-in booth is right outside. The Amex Centurion Lounge is for Amex Platinum and Centurion cardholders plus 2 guests. It is located inside the new Armstrong Stadium on the 2nd floor near Gate A. However, there is no direct view of the stadium once inside. An elevator (with A/C) takes you there from the 1st floor. Heat advisory warning of 90+ temps and heat index are expected on opening week. We shared our first-hand experience with some new shade tips and pictures for the Armstrong Stadium. The Chase floor can accommodate well over 50 people and feels twice as large as the Amex Centurion lounge. 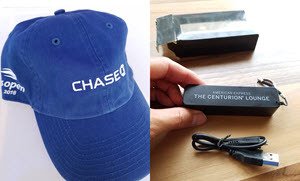 Anyone with a Chase wristband once registered may enter. The Centurion was almost always filled up and guests must wait for guests to leave before more can enter. The appetizers include a sandwich or gyro (usually one is veggie), chips, fruit, a small wrap, plus some delicious cookies. New plates of Hors d'oeuvres are served at least twice an hour to the group. Small Evian bottles of water are free and easy to refill outside; simply ask the bar. You also get 1 free complimentary drink coupon when you enter. If you select the "Honey Deuce" be sure to hold onto the 50th-anniversary cup it comes with. The bathroom is also slightly nicer with even a Dyson hand dryer inside - standard amenities found at other Centurion lounges. Both are quality items ~$20 in value. The Chase blue cotton hat is adjustable and very useful in the sun. The Amex small battery charger has both a USB and iPhone charging cable with a several hours worth of charge. Many large flat screen TVs line the entire length of the suite. Nearly every seat in the house can see the scores of multiple matches. The open layout allows many people to walk freely inside and does not feel crowded at all. Water, lemonade, and coke are dispersed freely at the bar. The coffee station is also at the opposite corner of this picture below. The Amex Centurion lounge relies on a few large, centrally-placed LCD TV's. The U-shaped bar is right in the middle with a giant TV in the middle of it, but there is a lot of view obstruction as people walk around. Registration and Accessibility - Tied? 2 different systems, but for the Chase lounge you must plan in advance and the other you must wait in the sun while others are inside enjoying the space. 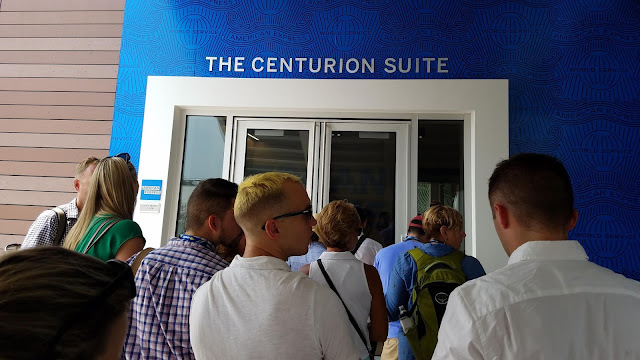 The Amex cards are more expensive to obtain but if you have one then entering the Centurion Lounge is only a matter of waiting. You need to RSVP online early with Chase and hope that you get upgraded. Also on day 1, I received a phone call and voice message regarding that I had been granted access. Do not give up hope if you register for the RSVP and get put on the waitlist. Check with the booth outside if you are unsure if you are on the list. For the Centurion Lounge, it has a lobby area which verifies your Amex membership level (Platinum or Centurion cards). The lobby registration area only accommodates about 6-9 guests at a time, so everyone else must wait outside the big doors.